Being a part of the TLC Family Camps comes with tremendous benefits that we hope you notice each day your child gets off the bus. As such, we wanted to share a new initiative that truly recognizes your loyalty and encourages you to stay with “our family” for your child’s full camp experience. Stay in the TLC Family & Save on Sleep-Away! Did you know that as a camper at North Shore Camp, we automatically place 10% of your paid tuition every year into your Summer Camp Account! When your child is ready to go to sleep-away camp, you can use the accumulated funds towards their tuition at one of our 3 residential camps. *Paid tuition numbers are just for example purposes - not representative of actual future amounts. 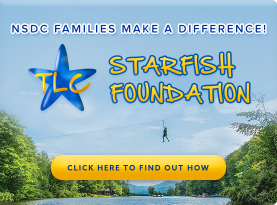 The TLC Loyalty Rewards Program will provide credits for each year that a child attends one of our Day Camp programs. Credits will accumulate for as many consecutive years as you are in our programs. The credit is based on the actual out-of-pocket tuition that you pay for whatever program your child is enrolled in. When it comes time for a Day Camper to consider sleep-away, you can redeem your credits at any one of our three sleep-away camps (credits will be spread over 2 summers for Timber Lake West as it is a short-season program). These credits will accumulate if you stay with one of our programs throughout your child’s camp experience and will accrue each year as long as he/she continues without interruption. Nothing is more important to us than having our campers grow within our TLC Family!